Business Planning is fundamental to success in business – managing the company, generating sales and growing jobs. 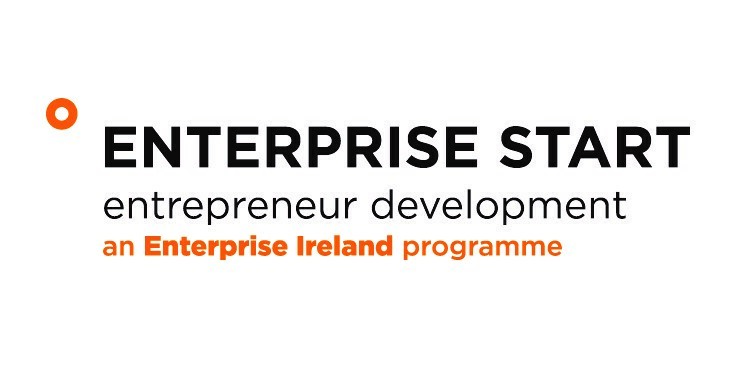 If you have an idea for an innovative and ambitious start-up business that has the potential for exporting and growth in International Markets, then Enterprise Ireland can assist you in exploring your new business idea through the Enterprise START Workshops. The ITLG Silicon Valley Global Technology Summit is a not-to-be-missed opportunity to network with tech leaders and investors from Silicon Valley and beyond. This year’s program will focus on the critical ingredients of the tech boom: Education, Investment and Entrepreneurship. Investors looking for opportunities in every space from big data to agtech. Leaders hoping to understand and capitalize on the transformational technological changes sweeping the industry. Innovators hoping to learn about the new directions colleagues are taking their field. Elected Officials and Policy Makers hoping to understand the radical shifts that are transforming the technology industry. Apple–will join us to share their visions for the industry’s future. Visit itlg.org for a current list of confirmed speakers. Thursday, 23rd April 2015 saw our Eleven companies Graduate from the New Frontiers Programme. Starting in September 2014, the companies have endured 6 months of intensive training. We at the LINC wish them all the very best of luck moving forward with their businesses. Left to Right Back Row – Oisin Geoghegan, Una Cahalan, Daire O’Neill, Daniel Sage, Alison McIntosh,Hugh Hayden, Pat Walsh, Chris Gregan, Colm O Maolmhuire, Gerry Delaney. 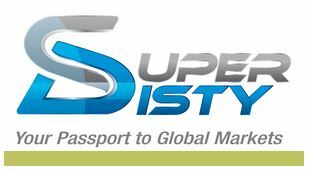 SuperDisty is a new software solution aimed at making life easier for manufacturers and distrib utors engaging with online markets. The Kompetenzzentrum honoured the 750th course participant, Niall Delaney from Dublin who takes part in the two week course for Passing Housing and Sustainable Energy technology using timber frame construction. 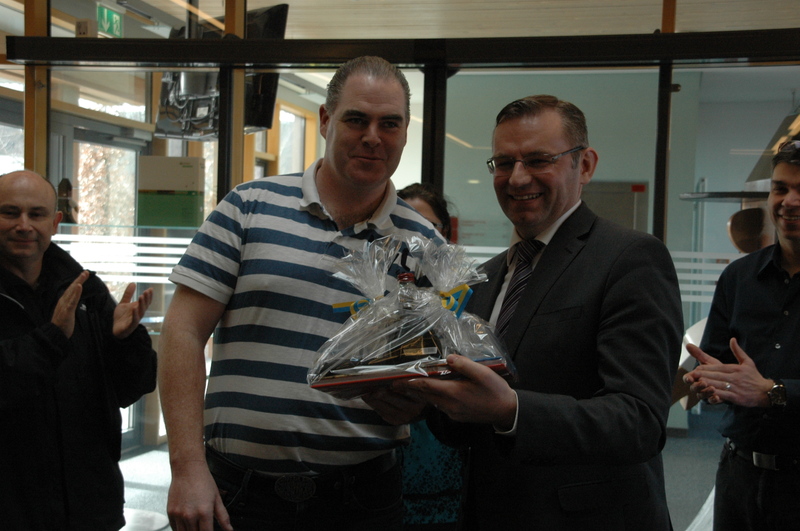 Norbert Lins, member of the European Parliament, visited the centre to congratulate Mr Delaney. The Irish participant himself offers courses on timber construction at the Institute of Technology in Dublin. The first week of the Passive House Course covers mainly theorectical lessons. “In the second week they will also have some practical experiences“, adds Gerhard Lutz. 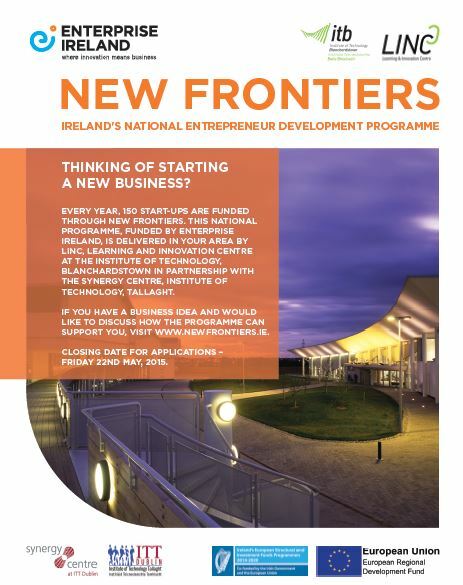 The New Frontiers Programme is Enterprise Ireland’s national entrepreneur development programme. If you have an innovative business idea and are planning to establish and run your own company, the New Frontiers Programme could be for you. We provide knowledge intensive, export oriented companies with a package of supports to help accelerate the business and to equip you with the skills and contacts that you need to successfully start and grow your company. On the 26th February 2015, the LINC played host to a Governance Masterclass for Non-Profit Organisations seminar. Organised by the partnership of the Institute of Technology Blanchardstown and Fingal County Council, the event attracted over 70 people. The Seminar gave attendees and understanding of the Governance Code for Community, Voluntary and Charitable Organisations. ITB staff involved was Des Moore (Head of Civic Engagement), Francis McGeough (Academic Staff), Tom Donohoe (Academic Staff), and Mark Lonergan (Academic Staff). 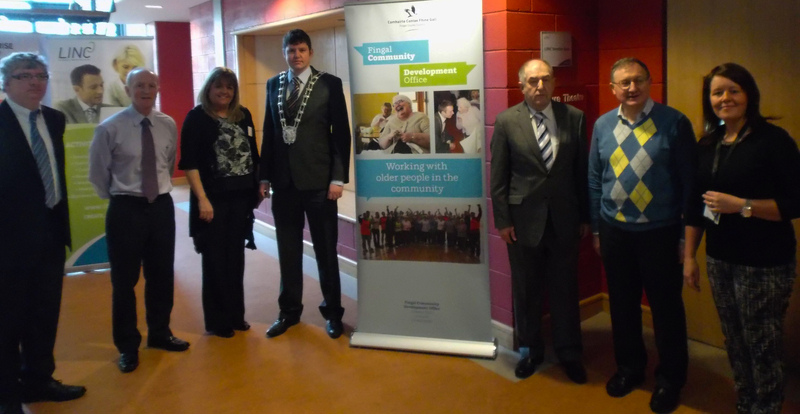 Keynote Speaker for the Seminar was Cllr Tom Leddy, Deputy Mayor of Fingal. 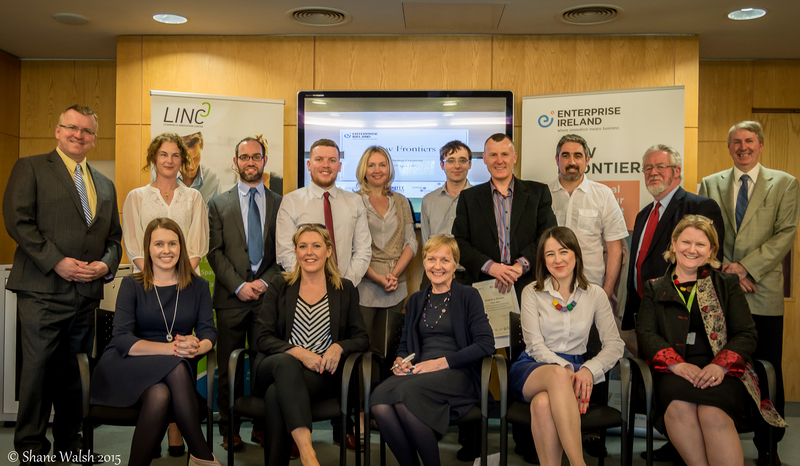 On the 11th of March 2015 10am – 12pm, the LINC will host a Create Learn Grow Seminar on Horizon 2020 which will focus on SMEs. The seminar will be facilitated by Jill Leonard who is Enterprise Ireland’s National Contact Point for SMEs in Innovation.